This case study is a part of the education endeavor of AK clinics in which we have earlier also shared some cases and will discuss further as well. 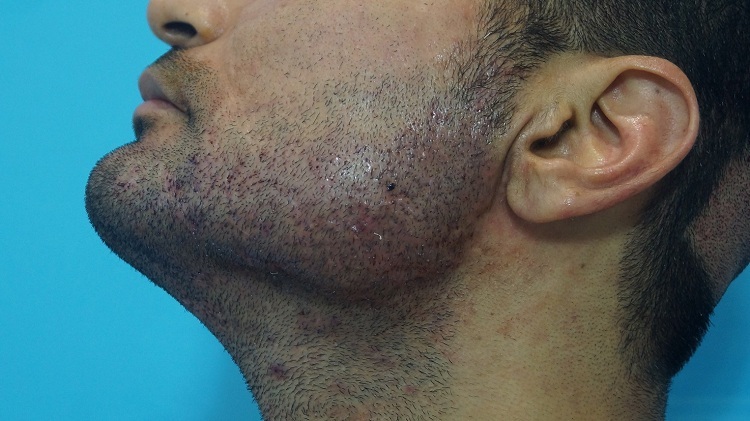 This particular case study is about Mr. Singh, 29 years old male who was diagnosed with severe scarring on face in beard due to recurrent nodulocystic acne since last many years. We are hereby presenting the features, causes, diagnosis and treatment that was administered to him. 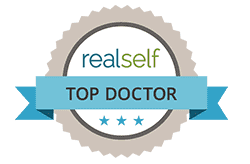 Features: When Mr. Singh first walked in to our clinic, he came with the severe scarring due to acne on the face, especially in the beard area. On careful examination there were multiple atrophic scars ranging from few millimeters to 1.5 cm2. 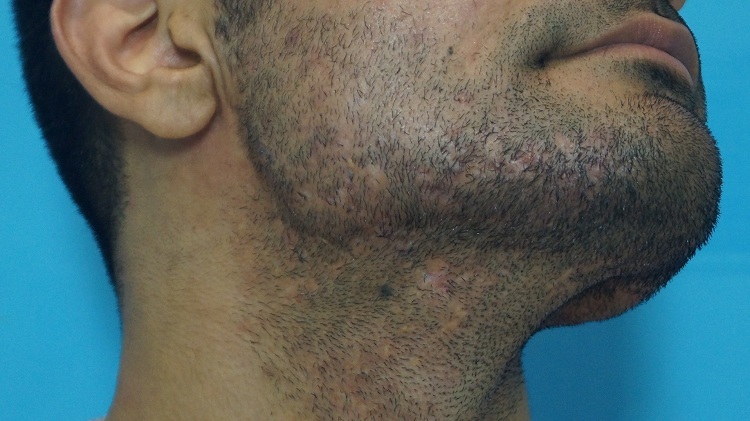 Also there was loss of beard hair in those particular affected scars making those scars prominently visible when patient keeps the trimmed beard. But there was no active lesion of acne at the time of examination. According to history, patient took the treatment for nodulocystic acne in past and since last few years he was not having any acne lesion. Cause: The cause of acne is multifactorial and severity varies from person to person. Most of the patients have acne problem during their teenage and if not treated promptly and adequately, it may leave permanent scarring on the face. Diagnosis: Diagnosis was made clinically on the basis on history and examination of affected area and did not require any special investigation. 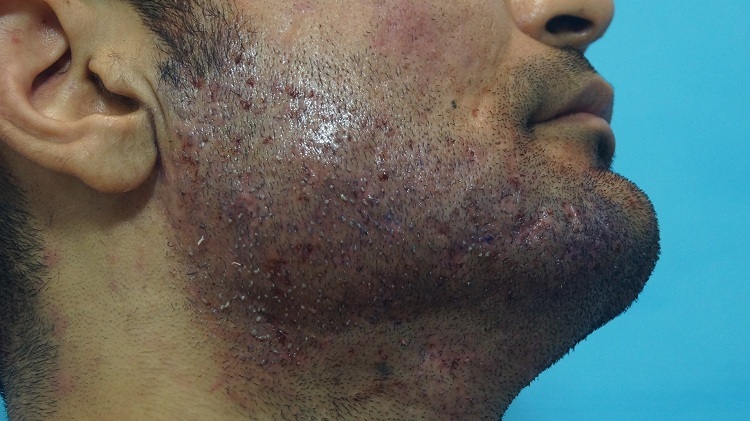 Treatment: As the patient had no active lesion of acne, he did not require anything for that but the scarring and patches of alopecia in the beard were of cosmetic concern. 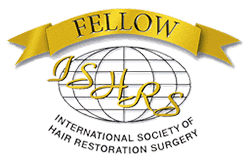 He had consulted earlier also outside for hair transplant and had undergone a trial of 30 grafts of hair transplant as well. Thus, we also suggested him hair transplant in the affected areas to camouflage the scar and get the normal looking beard so he can even keep the trimmed hair in the beard without having visible scars on the beard. Around 1400 grafts were used to transplant in the scar area and to get the beard in perfect look. Special attention was given in regards to following points during the surgery to create a natural look with best possible outcome as the scar tissue has minimal to no blood supply that can adversely affect the survival of implanted grafts. The force required to create the slits is more as scar tissue is harder than the normal skin, so CTS blade must be sharp enough to penetrate the skin without much of the extra force. Skin has to be fixed more firmly by taking help from assistant to decrease its fluidity to make the slits in proper direction with lowest possible angle. The density is given less in the scar tissue in comparison to the beard recreation done in the normal circumstances. This is because the vascularity is less, so more grafts will require more vascularity for the survival which is not possible in case of scarring. Once the result of first surgery comes and if patient feels that the density is low, another sitting can be undertaken to increase the density to get the desired result as the nature of scar tissue will be changed slightly and the vascularity will be increasedto some extent because of the already growing hair due to previous surgery.This way a surgeon can achieve a good result with optimum survival of the implanted grafts. 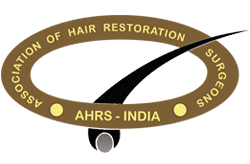 The caliber of the beard hair is more in comparison to the scalp hair, so hair must be extracted from the center part of the occiput where the hair are thicker than the other area. Beard hair mostly contains single hair, so surgeon may choose only single and double hair grafts to match it. 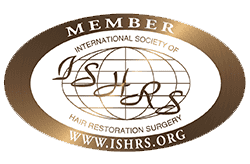 In the small and very superficial scars which are minimally visible or just visible because of the absence of hair, single hair grafts are preferred. 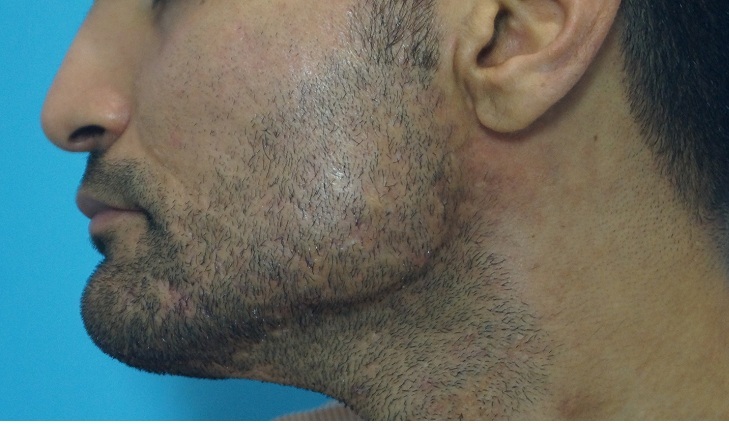 Such scars were mainly present in the cheek portion of beard in our patient. The larger scars were mainly present along the jaw line. We implanted two and three hair grafts in such scars are density given was already low so create a volume we preferred such grafts. 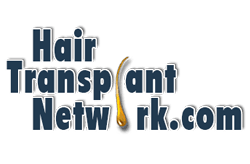 The idea behind this is though we are implanting less number of grafts with low density the more number of hairs will grow which can camouflage the area effectively. 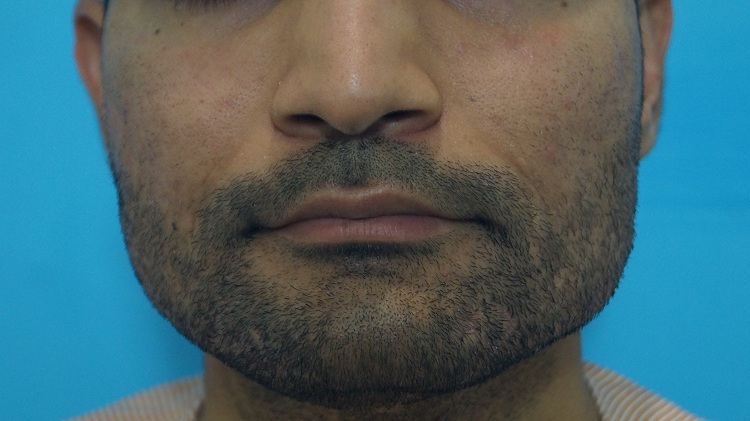 Further the lower area is less visible if patient grows beard hair slightly longer so despite of having three hair grafts it won’t look unnatural. Another reason for using the larger grafts with two and three hair in the bigger scar tissue is that the inelasticity of the scar tissue, so the slits tends to become wider and bigger during the manipulation which sometime do not collapse even when the stretching is released so can’t hold the smaller grafts properly in the same angle and direction. Following are the pre and post procedure photographs. Now patient is happy as scars are not visible and he can keep the trimmer hair on beard. Conclusion: Beard hair translation can be considered in a patient with patchy alopecia in beard due to various causes once the primary cause for the alopecia is no longer active. It can also be used as method of camouflage to hide the scars in beard area if patient is ready to keep the sufficient length of beard hair.